Places to see at Temi Tea Garden: The surrounding region of Temi tea garden is a haven of some exotic bird species like the Rusty-bellied, Lesser Shortwings, Satyr tragopan, kalij and numerous butterflies. 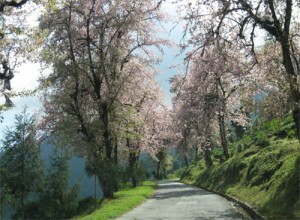 Apart from the tea estate, the region is mainly dominated by large cardamom plants and cherry blossom trees. The tea garden also offers some breathtaking view of the surrounding villages and the entire range of the Eastern Himalayas with Mt. Kanchenjungha towering in the middle. 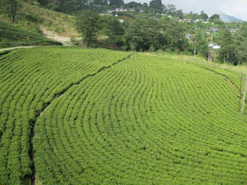 The Temi tea garden is known for manufacturing a popular tea brand, called ‘Temi-Tea’, famed for its rich aroma and taste. Do not miss the picturesque view of tea plucking, which is an enduring experience. You can also visit the factory to gain some interesting knowledge on tea processing. Nearby attractions of Temi Tea Garden: Pelling, which is renowned for its charming natural beauty is an ideal location to make an enjoyable trip from Temi. Located in the district of West Sikkim, Pelling is nestled at an altitude of 7200 feet, offering some stunning views of the snow-clad peak of Mt. Kanchenjunga and other peaks of Eastern Himalayas. Pelling also has some notable ancient Buddhist monasteries in Sikkim, the most famous being the Sang Da Choeling Monastery and Pemyangtse Monastery. 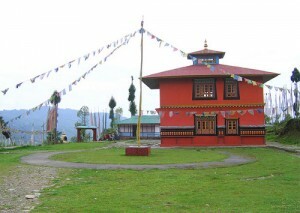 Namchi, the capital of South Sikkim is another popular destination, located at an altitude of 1675 m above sea level. 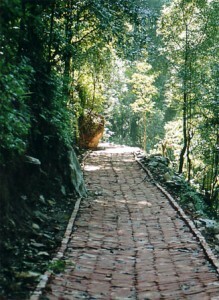 It is located at a distance of 78 km from Gangtok. In Bhutia, the word ‘Namchi’ means ‘sky high’ and this township is gradually gaining popularity as an amazing tourist destination. The prime attraction of the place is the statue of Guru Padmasambhava measuring 135 feet, in Samdruptse monastery. You can also savour the majestic view of Mt. Kanchenjungha from this location. The upcoming Chaar Dhaam point also attracts tourists. 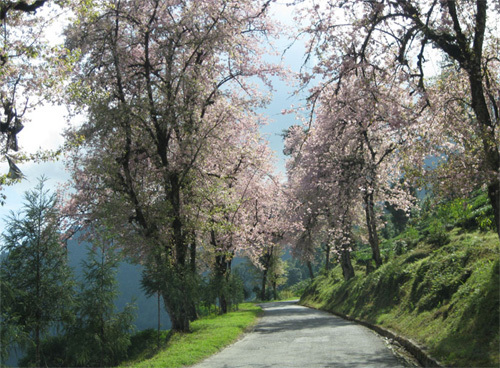 Trips are also made to the serene hamlet of Ravangla, located at an altitude of 7000 ft. This place located in South Sikkim District is slowly emerging as a natural tourist retreat offering splendid snow view. It is an ideal location for village tourism. Ravangla, overlooked by colossal snowy mountains, picturesque tea gardens, exotic flora and fauna, ancient monasteries and charming villages has all resources to become a tourist hotspot. The trek adventurers also prefer Ravangla as the trekking routes to Tendong Hill and Maenam Hill originate from this place. Some other notable places where you can organize day trips are a number of nearby destinations of West Sikkim like Rimbi Waterfalls, Sewaro Rock Garden, Khecheopalri Lake, Rabdentse Ruins, Pemyangtse Monastery and Kangchendzonga waterfalls. Things to do in Temi Tea Garden: The pristine manicured Temi tea garden welcomes tourists to savour the beauty of the surrounding picturesque landscape. You can also visit the tea factory in the garden to view tea processing. Many tourists also prefer to spend few nights at the resort nestled in the tea garden. Near the tea garden, there is a small outlet operated by the ‘Tea Garden Employees Consumers’ Co-operative society Ltd.’, which sells some quality packaged tea for visitors. You can find brand names like Temi tea, Sikkim Solja, Mysteaque, Orthodox dust tea and Kanchanjunga Tea. Enjoy a nature walk along the scenic tea garden, exploring the pristine Himalayan hamlets, birds and butterflies. You can also visit nearby Ravangla to indulge in Maenam Hill trek or trek to Tendong Hill from Damthang. How to reach Temi Tea Garden: You can avail the regular buses running to Temi or can hire taxis from Namchi, Pelling, Ravangla, Pelling or Gangtok. Rented cars are also available from Bagdogra or New Jalpaiguri to reach Temi. New Jalpaiguri is around 3.5 hours and Bagdogra is around 4 hours from Temi. 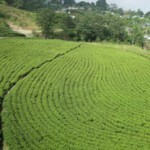 Best time to visit Temi Tea Garden: Temi Tea Garden welcomes tourist all the year round. However, if you want to relish the amazing sight of the cherry blossom in full bloom, it is best to visit during November and December. The best time to view Mt. Kanchenjumgha and her allies is from October to February. 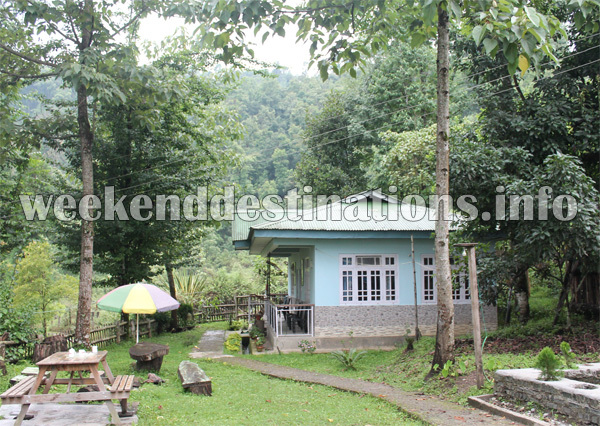 Lodging and Dining facilities at Temi homestay: Apart from the luxury category Cherry Resort, there are few homestays near Temi Tea Garden too. There are 4-bedded rooms and Double bedded rooms in these home stays equipped with all modern facilities like attached western bathrooms, hot water geysers, TV in room, private parking, landscaped gardens and backyard personal tea gardens. These Temi Tea Garden home stays not only offer homely accommodation but arranges for sightseeing trips, treks and cultural programs. The food served is essentially home cooked Indian cuisine and the supplies are locally farmed organic vegetables and spices.